University of Maryland undergraduate aerospace engineering students won second place overall, and first place in the Habitat Design technical theme, in the 2014 Revolutionary Aerospace Systems Concepts-Academic Linkages (RASC-AL) competition. Sponsored by the National Institute of Aerospace and NASA, the RASC-AL competitions are university design challenges that address NASA’s new approach for future human space exploration. From left to right: UMD students Brooks Muller, Kyle Zittle, Rajarshi Chattopadhyay, Irene Borillo Llorca, Oliver Ortiz, Ben Mellman, Mike Schaffer and Aerospace Engineering Professor David Akin. UMD's project, "Variable Gravity Habitat for Space Operations, Exploration, and Research," was the work of undergraduate students in the Department of Aerospace Engineering's spring ENAE 484 class, Space Systems Design, taught by Associate Professor David Akin and Professor Mary Bowden. This year’s RASC-AL competition challenged students to come up with a system design that leveraged existing or planned space habitat/logistics carrier structures and configure a small crew-tended outpost in cis-lunar space that could augment the Orion to stay at the cis-lunar destination for at least 30 days while also providing an airlock based extravehicular capability. Student teams then choose one of the challenge's themes—such as habitat design and human assisted sample return—to decide what mission the facility will enable Orion to complete. To participate in the competition, student teams must be selected based on their abstract submissions. Once chosen, the selected teams develop a 15-page technical report and must present both a poster and oral presentation before a panel of NASA and industry experts during the RASC-AL Forum. 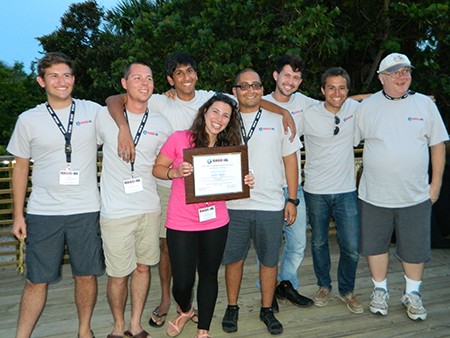 As part of the team's second place win, they will receive a cash award to present their work at the American Institute of Aeronautics and Astronautics (AIAA) Space 2014 Conference August 4-7, 2014 in San Diego, Calif.
For more information on the RASC-AL competitions, visit their website.